Can 3D Printing make Economical Auto Parts? There are lots of aerospace application s for Additive Manufacturing (AM). The aerospace industry is characterized by short production runs of expensive parts. In that scenario, AM can lead to a lower overall cost when compared to the cost of expensive tooling for a conventional subtractive manufacturing process. However, AM techniques in the automotive industry have been primarily focused on prototyping to increase research and development efficiency and reduce product-to-market time delivery, rather than on actual manufacturing. Used as rapid prototyping, AM shortens design validation and implementation cycles and helps release new components versions quickly. 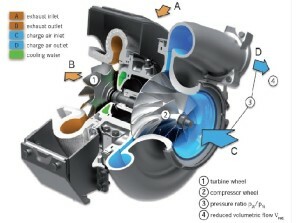 General function and components of turbochargers. But are there uses for AM as an alternative production method in its own right? Can AM allow manufacturers to build functional components in a cost effective way where conventional manufacturing techniques actually cost more? The answer appears to be “yes”, particularly when the process allows manufacturers to integrate or combine components in a single step, such as when surface textures, complex inner channels and meshes are involved. AM techniques can also make economic sense for customized high-value car components. Diesel engines are often turbocharged and aftercooled to enhance the engine's power capacity and its fuel economy. A turbocharger is an assembly of different components: compressor, compressor housing, shaft, impeller, impeller housing, and a gearbox (centre) housing. 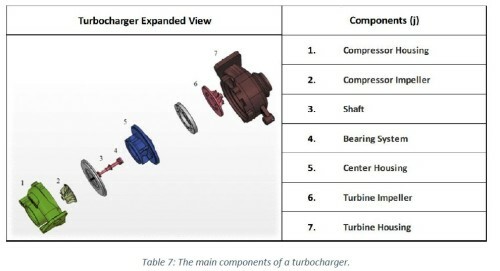 Turbocharger expanded view showing main components: 1.compressor housing; 2.compressor; 3.shaft; 4.bearings; 5.centre housing; 6.turbine; 7.turbine housing. Turbochargers are exposed to extremely high thermal and pressure stress. Typically, the center housing integrates inner channels that supply bearings with pressurised engine oil for lubrication. Internal water-cooling passages are designed into the housing to keep the lubricant cool and in a liquid state (it can be cooked solid by extreme heat!). The center housing is usually produced by sand casting and then post-machined to form the internal cooling and lubrication channels. Design, engineering and production considerations show that manufacturing the center housing using an AM process like Selective Laser melting (SLM) is most likely to contribute to the efficiency and cost-effectiveness of the turbocharger. Selective Laser Melting (SLM) offers maximum design freedom for complex and light rigid components. Design engineers have the can develop more complex internal channels in the center housing to improve the cooling and lubrication system by extracting more heat. For example, MTU Friedrichshafen GmbH developed a high-performance turbocharger with a water-cooled casing and compressor that had inner channels to decrease surface temperature. This design resulted in a lower thermal load on the intercooler, which in turn could be reduced in size and weight. The centre housing is more easily optimized using the more flexible SLM manufacturing constraints. In this case, the design engineers were able to improve the lubricant and cooling channels to prevent heat damage. Efficient cooling of the shaft and bearings promote larger RPM values, boost pressure and air flow to the cylinders. Improving turbocharger efficiency reduces fuel consumption and fuel temperature, significantly reducing CO2 emissions. In addition, the lower exhaust gas temperature leads to increased lifespan for the turbocharger and minimizes thermal stresses and maintenance costs. Another advantage to the AM process is that the housing can be made of steel 316L (instead of conventional cast iron), which leads to improved strength. Compared with sand casting, a center housing manufactured by AM requires less post processing. SLM technology also eliminates waste material and saves up to 50 % of the end design volume with by avoiding fusion in non-functional areas. With international pressure to develop sustainable energy efficiency and reduce Co2 emission, SLM manufacturing techniques allow design engineers in the auto industry more freedom in product development. In this turbocharger example, AM manufacturing was able to deliver successful weight savings, increased fuel efficiency and improved components lifespans while limiting ongoing lifecycle costs from heat damage. About the Author: Steph is a university researcher and editor at Inside Metal Additive Manufacturing : a site based on academic research and dedicated to 3D printing of high-value metal components.